Yes. I know December was almost two weeks ago. But I still want to talk about the books I read! Reading slumps are the absolute worst. 2018 had been awful for me in terms of reading slumps. It seemed that every other month, I lost all motivation to read. I’m really hoping 2019 will be better for me! In December, I barely read. It was awful. I did manage to reach my monthly goal of 10, but there were a lot of short stories and novellas mixed in there to help me out. Read more to see what I actually did manage to finish! I read 10 books this month, and it was definitely a struggle to keep my reading speed while doing NaNoWriMo. I’m just glad I managed to reach 10 with the help of a few novellas. Plus, now I’ve written my own book. That should count for something! New York Comic Con is perhaps my favorite time of year (maybe second only to Bookcon… it’s hard to decide). From amazing cosplays to hilarious panels, you will always have something to see when visiting the Javits Center Columbus Day weekend. This year, I was able to go on Saturday and Sunday, with some fun Disney cosplays. The real reason I love NYCC? That would have to be the free books. From ARCs to finished copies, there are dozens of free books handed out by the publishing booths. And when it comes to getting free things, I plan things out to the minute to make sure I can get as much as possible (a trait that really comes in handy at conventions). I typically try to stick with that plan, but this year a lot of the books I got were completely by coincidence. Saturday was definitely my craziest day. I had to wake up at 5 in the morning to start my Belle transformation before leaving at 7 to begin the trek into the city. I live out on the North Fork of Long Island, so the drive can be a little long, but not long enough to make a hotel worthwhile. We had some issues getting parking, something that had never happened in the previous 3 years I’ve gone to NYCC, but of course one of the subway lines had to be down this weekend so everyone was driving in. Luckily, we got to the convention at around 10:30, just on time for me to sprint over to the Fierce Reads (Macmillan) booth to line up for an ARC of Tricia Levenseller’s Warrior of the Wild (Release Date: 2/26/19). If I left with only one ARC, I would have wanted it to be this one. I absolutely adored her Daughter of the Pirate King series and I’m dying to see what she writes next. After that, I was also lucky enough to get my hands on We Set the Dark on Fire (RD: 2/26/19) by Tehlor Kay Mejia and Stolen Time by Danielle Rollins (RD: 2/05/19) and I got to go to a signing of A Memory Called Empire by Arkady Martine (RD: 3/26/29). Later, I was also grabbed a copy of The Afterward by E.K. Johnston (RD: 2/19/19). I ended up not buying too many books, only three that I’m really excited to start reading. The first is The Wolf Queen by Cerece Rennie Murphy. I’ve been visiting her booth at NYCC since my first convention four years ago. Her books always amaze me and I always look forward to getting to see what she’s written. Plus, she is one of the nicest human beings! Her books are also available online, so go and pick up a copy! I also met an author I haven’t read before, Nicoline Evans. She had a variety of books but her Haemans series is the one that stuck out to me (she described it as a dark Anastasia-inspired book with zombies, so I was sold). On Sunday, I only really wanted one book, and that was Sherwood by Meagan Spooner (RD: 3/19/19). I’m so glad I was able to get that, plus a few others! The most surprising book I got was Slayer by Kiersten White (RD: 1/8/19). I had no idea they were even dropping the ARC, and I’m so grateful that someone I was on line with (for another book) told me about it! Buffy the Vampire Slayer was my life in high school, and I am so glad I was able to get my hands on an ARC of Kiersten White’s book that takes place in that universe! I also got to go to a signing of Sleeping Giants by Sylvain Neuvel, and was able to pick up an ARC of The Women’s War by Jenna Glass (RD: 3/5/19). My September 2018 Wrap Up! I read 10 books this month, including only 1 from my September TBR! This month I was a lot more motivated to read in comparison to the Great Slump of August 2018. It took a while for me to get motivated, but I did and I’m so happy! My (Super Late) August Wrap Up! I read 10 books this month, including only 1 from my August TBR! I really struggled with reading this month. I was in an awful slump, but I’m hoping September will be better. And yes, I know I’m counting some really short novella’s/scenes, but I read so little this month that I want every page to count. 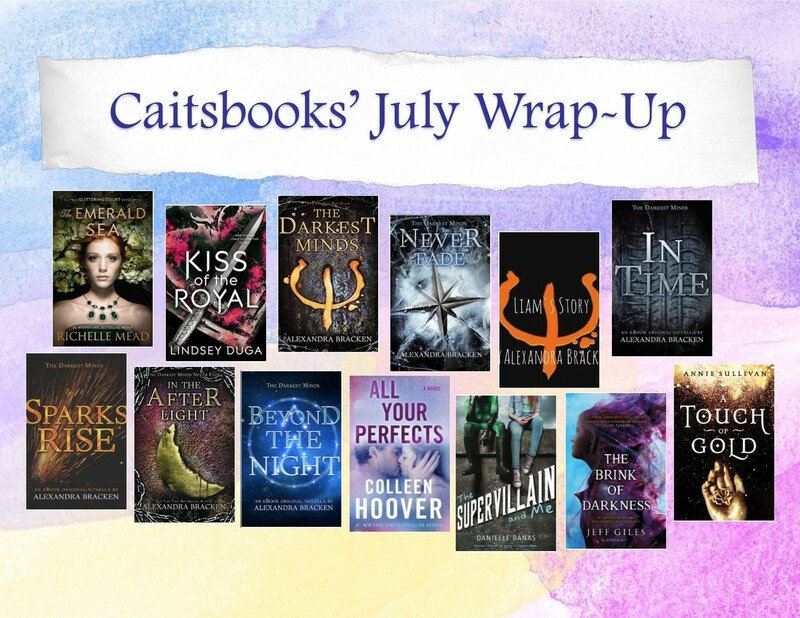 I read 13 books this month, including 4 from my July TBR!